“I try to imagine that something miraculous can happen even during the most difficult and troubling times. We have to believe in human imagination, to believe that if we make an effort, something will change and the world will be different,” says artist Ai Weiwei of his new sculpture, Life Cycle, installed inside the vast Marciano Art Foundation, the site of his first major institutional exhibition in Los Angeles. Indeed, the Chinese dissident’s new work evokes whimsical kite-making techniques using weightless strips of dried bamboo, yet the sculpture takes the shape of an overfilled rubber boat, referencing the current global refugee crisis. This fall in L.A., Ai is using such disparate materials as bamboo, marble and plastic Lego bricks to create haunting works—that speak magnitudes—on display simultaneously in a trio of venues: the Marciano, United Talent Agency’s new Beverly Hills-based Artist Space dedicated to its growing stable of fine artists, and Jeffrey Deitch’s eponymous, just-opened Hollywood gallery. AI’S LIFE CYCLE, A SCULPTURAL RESPONSE TO THE GLOBAL REFUGEE CRISIS, AT THE MARCIANO. 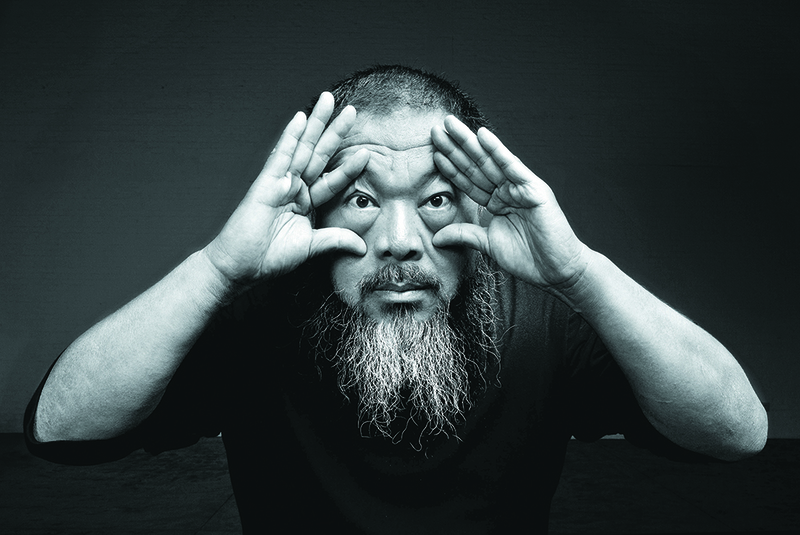 PHOTOGRAPHY COURTESY OF AI WEIWEI STUDIO AND MARCIANO ART FOUNDATION. The convergence of exhibitions came about almost by chance. Building permission delays pushed Deitch’s inaugural show for Ai to a fall opening, and the summer relocation of UTA’s gallery from Boyle Heights to a Beverly Hills building steps from the talent agency’s headquarters that Ai, also a trained architect, is helping to renovate also prompted an autumn show there. Add Maurice Marciano’s comprehensive presentation of Ai’s oeuvre, “Ai Weiwei: Life Cycle,” and the artist’s ubiquity this fall is assured. Ai is one of China’s most well-known living artists, routinely capturing the world’s attention with his prolific work, often focused on social justice and human rights violations. He grew up during China’s Cultural Revolution and spent his childhood in exile after his father, the poet Ai Qing, was declared an enemy of the state. Ai’s confrontational work and provocative criticism of the Chinese government led to 81 days in prison in 2011 (under the pretext of tax evasion charges) and months of house arrest in Beijing (sparking a #freeaiweiwei campaign) before Ai was allowed to leave China for Berlin in 2015. Deitch’s “Zodiac” brings together an assortment of Ai’s major works, from Stools, a vast 2013 installation of 6,000 small wooden benches used by generations of Chinese families (which the art dealer compares to a pointillist painting), evoking their shared heritage before the Cultural Revolution ushered in metal or plastic versions, to images of zodiac animals created with Legos that resemble pixilated digital photographs. UTA’s “Cao/Humanity” (the Mandarin word for grass as well as an expletive) includes sculptures of grass blades and a marble surveillance camera referencing the scores of surveillance lenses trained on Ai’s former Beijing studio. THE CHINESE DISSIDENT’S MARBLE SURVEILLANCE CAMERA WITH PLINTH AT UTA ARTIST SPACE. PHOTOGRAPHY © AI WEIWEI, COURTESY OF UTA ARTIST SPACE. Here is an artist who was a refugee as a child, spent years under constant surveillance, and is now shining a spotlight on the ongoing refugee crisis he witnessed firsthand while filming his 2017 feature, Human Flow. Ai’s work, as Marciano points out, is international. “When you look closer, there are so many ideas at play and in dialogue with each other, including art historical references, as well as ancient Chinese mythological imagery, text and language,” Marciano notes. Yet there’s also plenty of wit and whimsy, too; a deceptively decorative wallpaper installation called The Animal That Looks Like a Llama But Is Really an Alpaca in the “Zodiac” show appears to resemble a pattern of an Hermès scarf but is actually thousands of images of surveillance cameras. Michael Govan, director and CEO of the Los Angeles County Museum of Art, which showed Ai’s first major public sculpture in the city, Circle of Animals/Zodiac Heads (2011), will host a long-awaited Director’s Series conversation with Ai on Sept. 28. Govan likens the artist to a Socratic gadfly: “Ever creative and playful, Ai Weiwei’s work offers critique, but also, for me, optimism that awareness can create a better future.” “Zodiac” (Sept. 29-Jan. 5) at Jeffrey Deitch, 925 N. Orange Dr., L.A., deitch.com; “Cao/Humanity” (Oct.4-Dec.1) at UTA Artist Space, 403 Foothill Rd., Beverly Hills, utaartistspace.com; “Ai Weiwei: Life Cycle” (Sept. 28-March 3) at Marciano Art Foundation, 4357 Wilshire Blvd., L.A., marcianoartfoundation.org; “The Director’s Series: Michael Govan and Ai Weiwei” (Sept. 28) at LACMA, 5905 Wilshire Blvd., L.A., lacma.org.